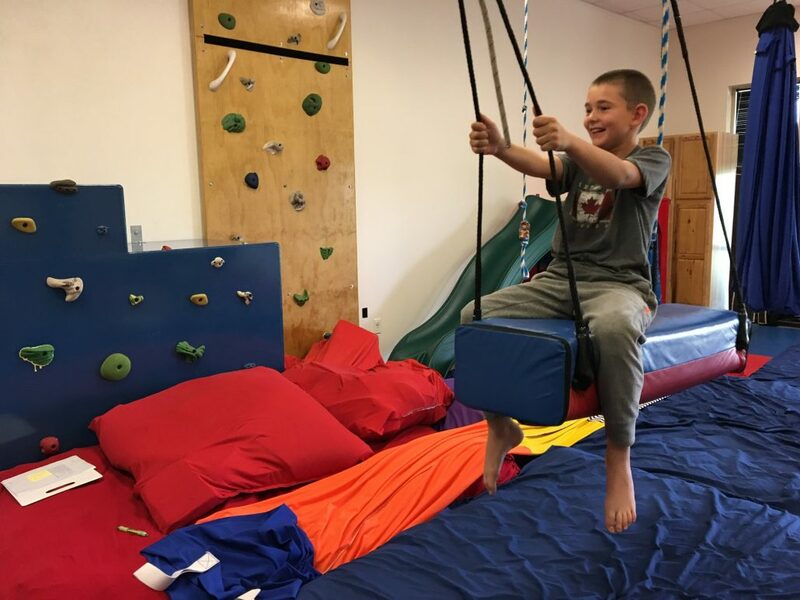 One of our favorite things that we have in our gym is the suspended obstacle course. This is the epitome of a motor challenge activity! We work on many different degrees of motor challenge and motor planning for all our kids who have a lack of coordination or dyspraxia. We have many swings in our gym, and if you look at them you’ll notice that most of them do not have steady surfaces. We have different types of unsteady surfaces to challenge our kids. 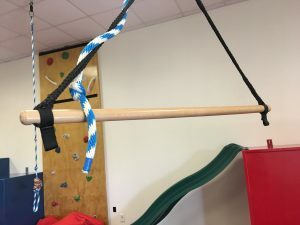 One swing we have in our suspended obstacle course is a glider swing that the kids call “the airplane.” It’s a long rectangular swing that goes side to side in linear motion—not circular, but linear. 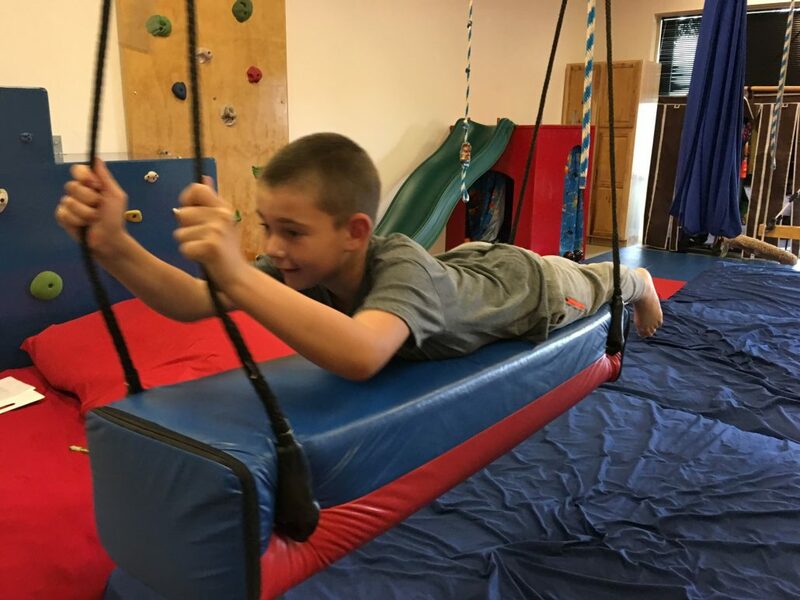 When we have a linear motion, it works our vestibular system. We can have someone lie on their stomach on this swing. We can have them sit up and pull the ropes to swing it. We can even have them stand and walk along it! We’ve even had the speech therapists on it playing games so that they’re swinging while playing games and having a social activity. Pieces of our equipment like this are only limited by your lack of imagination and creativity because they can be used for a multitude of things! Also on our suspended obstacle course, we have the air walker. We call this one the “Blue Goo!” This swing is like a big, hanging bag made of Lycra and it’s kind of like a womb space. When you get in it, you’re suspended in air and you can have your head out, or entirely inside. (If your child is afraid to be entirely inside the bag, they can stick their head out.) They can do bouncing motions in this swing, which gives them lots of proprioceptive and vestibular input. This is a great modulator. Also, the kids love feeling suspended in space! It’s a nice sensory experience. It’s also really tough to into and out of, which makes it a challenge. If the child is in the glider and wants to get into the swing, he has to go from an unsteady surface to a really unsteady surface. When you step in, your foot goes way down towards the ground! It’s not easy to get out of, either, especially if you’re lying flat inside it. The Blue Goo has ropes inside it to help pull yourself up, but it’s still a great challenge! Our next swing is a disc swing! You’ve probably seen these. For instance, Little Tykes makes a plastic one that’s popular. 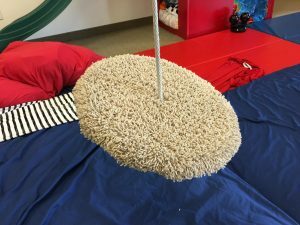 Our disc swing is covered in carpet because a lot of our kiddos end up falling off and we don’t ever want them to get injured—we have everything reinforced for safety. On this swing, you just sit and flex your legs together. A lot of our kids have such poor core strength that they’re not able to hold their body in flexion, which is that pattern you need to hold on to the swing. Many of them can only do it with their hands. 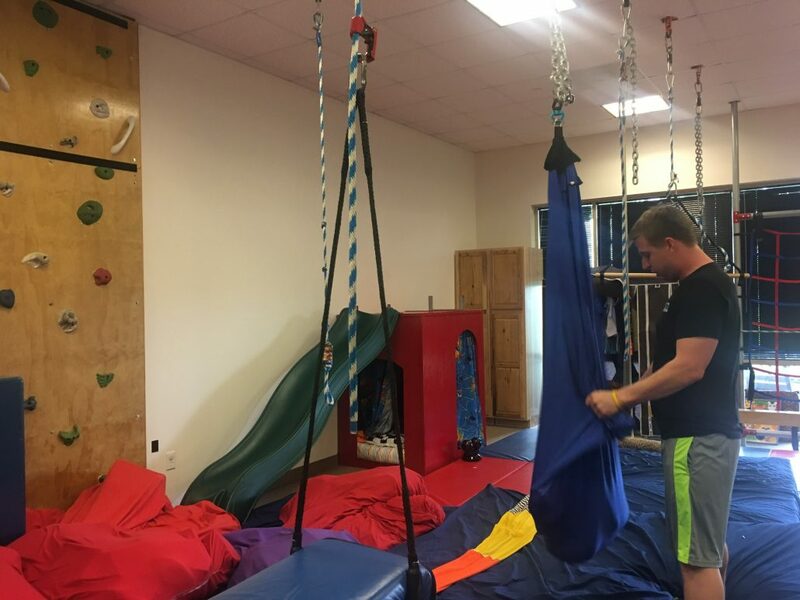 Then when we ask them to move their hand and reach for the trapeze bar that’s nearby, they don’t have the strength to hold the swing with the rest of their body. This makes this swing a great core strengthener! Next is our trapeze bar, which is something you have to have in an obstacle course! This is another modality that the kids have to use to transition from swing to swing. We call it a conduit or connector. When many of your kids hold the trapeze bar, they do it with their thumbs alongside the rest of their fingers. We’re working on getting them to hold it with their thumbs on the other side of the bar from their fingers. That motion with the thumbs gripping the other side of the bar is what they need for handwriting stability, and it’s a more mature grip. We also ask them to pull themselves up against gravity, so that their legs actually come off the ground. That’s an against gravity flexion position or anti-gravity position, and if they’re going to get to the next part of the obstacle course smoothly, they will have to clear the air! And all our kids know, the goal of this obstacle course is to not touch the ground! Our balance beam is the next stop on the obstacle course, and again, it’s an unsteady surface! 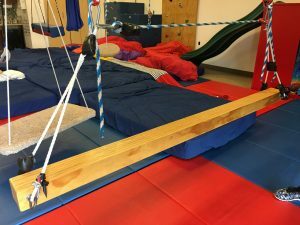 Imagine swinging from a trapeze bar to an unsteady, suspended balance beam. We will sometimes secure the beam for some of our kids early on in treatment. It still has an unsteady component that way, but it’s not as unsteady as when it’s not secured. The beam has added safety features such as straps and ropes. Many of our kids start off walking on this laterally while holding on to a rope. We work towards them walking in a forwards heel-toe motion. Walking on the beam also helps with postural reactions, like learning how far they can move their body and stay upright. So they’re learning about body control, and about how their hands and feet work together. The ultimate thing on an obstacle course is coordinating hands and feet towards success. We have lots of falls before we have success! We have over two dozen swings in here! We have two obstacle courses, and we have another one that’s lower to the ground. We’d love to have you come in and take a tour, and try out the swings! You might fall, and you might be surprised! We also allow our clients to rearrange these courses because that’s part of their learning to plan and make things work. So come by and take a look at them. They’re really fun! Do you want to see them in person? Schedule a tour with us!